Well it was the big Brand Equity Quiz again. Last year Abha and I had gone to attend the BEQ regional finals for Pune region and boy!! what charm did the winning team have. I think they were the best team we had seen on stage and they immediately became our favourites. The team was from Savoir Faire, Goa. Abha has been a fan of the team for the last whole year. But 2nd April was all the more interesting with this years Pune edition of Brand equity quiz. I had been preparing with Abha (well for those who dont know yet, she is my wife) for some time and had been ducking most of the Business related questions she kept asking for all of the month of March on dinner table, at morning breakfast and during our romantic drives on Pune roads. I also kept trying for the whole period to ask her questions that she might not answer (though most of the times I failed). Coming back to 2nd April, here we were, half an hour early at the venue, not at a surprise to see, Savoir Faire, the persistent team and the Boat club quizzers, all out there. Me and my partner Siddharth, were hopeful but unprepared :), abha and her partner Ramanathan were also hopeful but a lot more geared up for the day. Initially before Derek O Brien came for the final quizzing, there was an elimination round conducted by Andrew Scolt. It ranged from questions like "Nirma's initial price in rs./kg" to "which is the famous Biryani house in Hyderabad?" , from History to Alcohol, from Cricket to Michael Jackson, From stock exchanges to Grapes named after ministers..... A well conducted elimination round. Well as expected My team could not survive the elimination round itself, and i went back in the crowd sitting next to my parents and cousin. But Abha's team survived and it was a winning streak from there on for the team I cheered till end (it was absolutely weird to cheer 2 teams, the other being Infosys' Gaurav and Manish who came third). They were leading most of the times outperforming the champions Savoir Faire, it was a stunning performance from TCS (Abha and Ramanathan are from TCS Pune) as the game went in to a last round as both the teams were crawling 5 points with every question not losing to the other. The whole game went on to the last question, "K.C. Das is credited for invention of what? 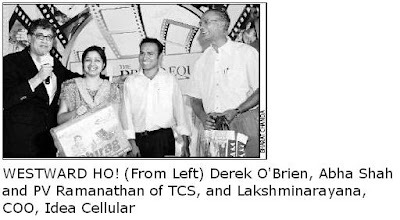 ", both the teams were at 70, and I knew that Abha's team had to go for it, a great quizzing effort made lady luck smile on them with the last question pertaining to kolkata (both Ramanathan and Abha have stayed long in kolkata), to press the buzzer and answer "Rosogulla". Derek in a classic Derek Style, didnot announce the winner till the last moment of prize distribution ceremony, making me and my family as tense as Savoir Faire Team's family. But at the end Rosogullas from TCS survived the Konkani trail blazers. And Jay, a delightful reading as always.. I didnt knew that having Rasgullas can also make u win Quizzes. I know about K C Das only because Abha didi used to bring Rasgullas of that brand whenever she returned from Kolkata. Also I dont know whom to appreciate more, Jay’s lively writing or Abha didi’s achievement. Your writing style is good. Why don't you write a book? Lovely post! Congratulations to the team! Well, I know PV Ramanathan since we made it to the regional final of Mumbai round of TATA Crucible Quiz - Corporate in 2006. Looking forward to see both of them excel in the finals on Sunday. Hey, great news! A bit belated, i know- but have been off the radar all this while! :) Pass hugs and hearty congrats to abha!